Research & Planning for new accounts or campaign expansion. This includes things like keyword research, display research and competitive intelligence. Campaign Management to improve existing campaigns. This includes optimizing keywords, text ads, account structure and landing pages. Analysis & Site Experience. This includes reporting results, finding areas for improvement, and managing projects using any number of quantitative and qualitative techniques. 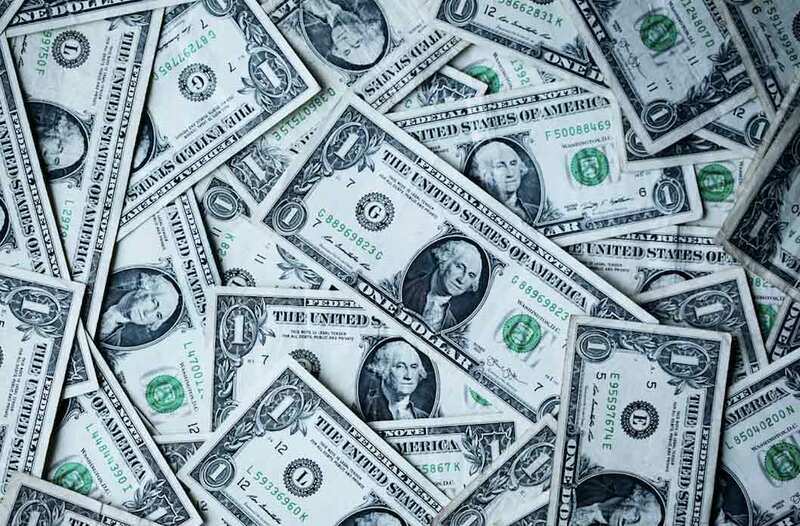 In order to be able to move from your current profit to your potential profit, you have to be able to do each of these areas more effectively and efficiently. 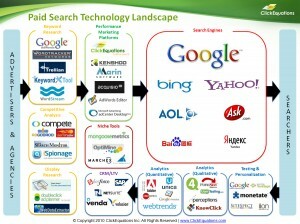 So how do you do that and how do search marketing tools fit into the mix? First, which problems can tools solve? Second, when does it make sense to invest in tools? The right tool to improve your profit depends on how mature your paid search campaigns are. In order to be able to close the profit gap, you have to start by identifying which types of problems are holding you back. There are 4 major types of problems: People, Process, Analytics and Technology. People: The first problem is People. One of the byproducts of a hot PPC market is that it can be difficult to find talent that has necessary expertise, so you have to hire more junior level people and train them. Or, you yourself are managing the entire paid search channel as one function or as part of many channels that you’re responsible for. Process: The second issue is process. 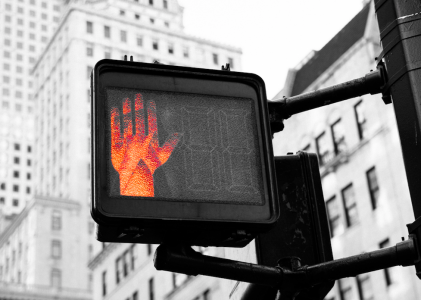 This means that there is some aspect of your workflow that is inefficient or ineffective. Often, you’re burning hours on tedious, low brainpower tasks. Analytics: The third issue is Analytics. Sometimes, you need to get more complete data or more accurate data in order to improve analysis and optimization. Technology: The final problem is technology. 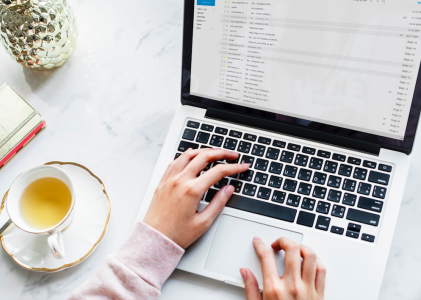 In some cases, you want to be able engage in certain marketing activities that would be impossible or very time consuming without technology, such as testing and personalization. Solving these problems isn’t necessarily a question of picking the right tool. It’s also about the gap of knowledge and experience keeping you from improving your return. On the left, we have advertisers and agencies, the buyers. On the right, we have the searchers, our target audience. The search engines are the marketplace we use to reach them. The companies in each bucket are representative, but obviously not comprehensive. There is a link to each company in the landscape at the end of this post. In this image, the y-axis is level of investment in tools and the x-axis is maturity. Maturity, as I use it on this curve, is about how critical paid search is to your company. The sophistication budget, campaign, and vertical all contribute to the overall importance of paid search to your bottom line. Task: Paid search is only one of many things you do. You have limited time, attention, budget, and experience. Most small businesses fall into this category. Channel: You have a more mature online presence or service offering and paid search is an important channel in that mix. Core Competency: Paid search is a leading component of your company’s marketing or services. You have extensive experience. A paid search agency would be a good example. Differentiator: You are an advanced paid search practitioner and paid search is fundamental component of your business model. Each stage of the maturity curve implies a different set of problems standing between current and potential profit. When paid search isn’t that critical, companies don’t spend a lot of time on paid search and tend to do it sub-optimally. They’re dealing with People and Process problems. As companies move up the maturity curve, expertise and methodology become much more established. Instead, more sophisticated questions and issues of scale mean Analytics and Technology problems start to surface. The right tools map to those problems and stages. Once you understand where you are on the curve, you can prioritize your investment in education and tools accordingly. When you’re in the Task phase, I’d recommend you minimize your investment in tools and focus much more on understanding how to use them effectively. As paid search becomes a more important channel for your business, you’ll still get the biggest return on investment by focusing on education. Broader search conferences, like Search Engine Strategies Chicago, and vertical conferences within your industry, like Internet Retailer or LeadsCon, are a great source. There are also affordable online training programs like Online Marketing Institute, AdWords Advantage and Market Motive. You might find that you need specialized keyword and competitive intelligence tools and it would make sense to invest in some less expensive customer relationship management tools to track lifetime value. It may also make sense to invest in some of the other tools, depending on which problems are most pressing. At this point, paid search is fundamental to your business. Your people and process are pretty set. If you need any education, an outside consultant is your best bet. Your problems are mostly going to be of the Analytics or Technology variety. You’ll need to invest in a performance marketing platform to get to the next level. Then, depending on your business model and website, you may need or want to buy a more specialized tool for measurement, testing or personalization. I would suggest that you start with testing and personalization, since improving your conversion rate lifts every channel and lets you move into auctions you might never be able to compete in without higher conversion. In the Differentiator stage, you’re likely the one educating other people. As a company, you’ll either buy high end niche tools or build something yourself. Needless to say, to reach this point you need a suite of tools. Investing in any one of these 43 search marketing tools listed below takes time and money. The right tool to improve your profit depends on how mature your paid search campaigns are. Before you take the plunge with any tool, take an inventory of your problems and prioritize. You’ll spend your time and money more wisely. 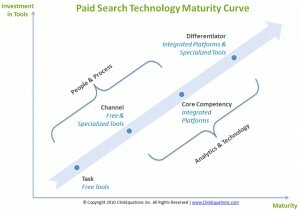 Download of copy of my presentation from Search Engine Strategies San Francisco, The Paid Search Technology Maturity Curve. Is it really the case that the investment in paid search [technology] should go up as maturity increases? Is this linear, or are there points at which one should invest more to get over a hump (like, hiring consultants to get started and then taking expertise in-house)? The straight line distracted me during your talk, and it continues to bother me. June is right: the relationship between maturity and investment in technology is not linear. Is it staggered? Does it gradually curve up and then diminish? Does it have a slow ramp and then a steep climb? Yes, yes, and yes. My curve is an obvious over simplification of the way people chip away at the problems between their current and potential profit. I’ll be the first to admit that it’s not a direct relationship and that I don’t have a perfect curve to describe it. That said, I think my classifications make sense, the key problems at each stage are true and that my recommended suite of tools and education is useful. I’d love to see what anyone’s curve looked like. Wait, What’s AdWords Doing in That Landscape? Let’s be clear: I do not think they meet the benchmark to be described as performance marketing platforms. However, I believe that’s how 80% of the market sees them. It’s a reference point for people to understand the idea of a tool where you measure and manage your paid search. Inevitably, whenever I create a list, I forget someone. I have probably omitted many worth and valuable tools. The tools listed in the Paid Search Technology Landscape cover most of the major players, but it is explicitly representative and not comprehensive. Honestly, I could only fit so many people on the slide without diluting the point. I encourage you to leave comments about your favorite tool (just remember, nobody wants a sales pitch in a comment). Maybe someone will even write a reaction titled the “43 Paid Search Tools Alex Cohen Forgot to Mention!” I promise to tweet it.